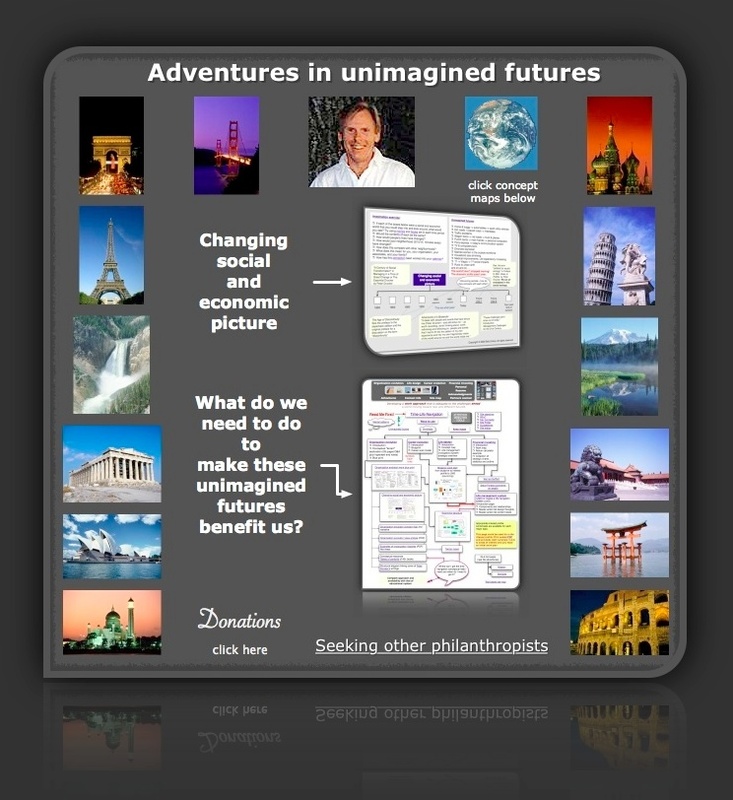 Time-Life Navigation :: adventures in unimagined futures through organization and career evolution plus life design. Adventures in Unimagined Futures: There isn't just one future. There have always been multiple futures in at least two different senses. There is the future that arrives due to some new "development." With each new development a new reality and new situation is born. These new realities emerge in both sequential and parallel versions. Consider the fact that major museums have exhibits for multiple periods, places, and topics. These exhibits are examples of multiple futures. In the second sense new futures treat different people differently. Unimagined: No one can foresee how things will work out. We know the future will be different from what now exists and from what we now expect. 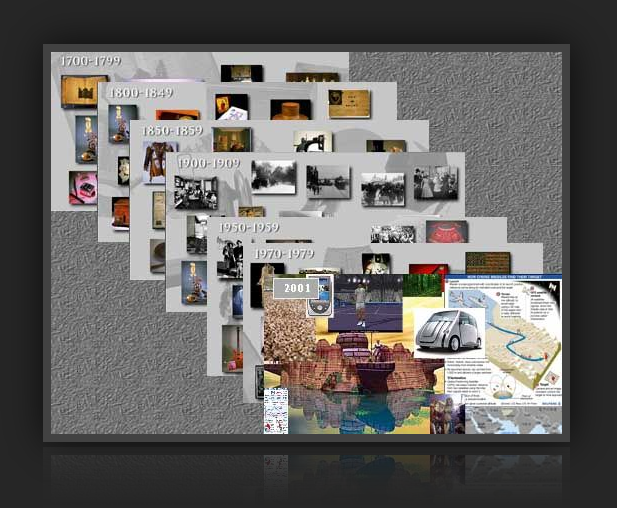 What we expect comes from our history (mental patterns). However we can create the future. See Chapter 10, Making the Future Today in Management, Revised Edition by Peter Drucker. Adventures: The adventure is trying to "surf" from one opportunity to the next without wiping out. One of the major opportunities in a modern society is building on people's strengths—across multiple time spans. Can you think of anyone whose life turned out as an adventure in unimagined futures? Can you think of anyone who took advantage of the changing social and economic picture to produce benefits for society? Where would you look? The process of exploiting the opportunities that time and history have placed within our grasp is the subject of this site. 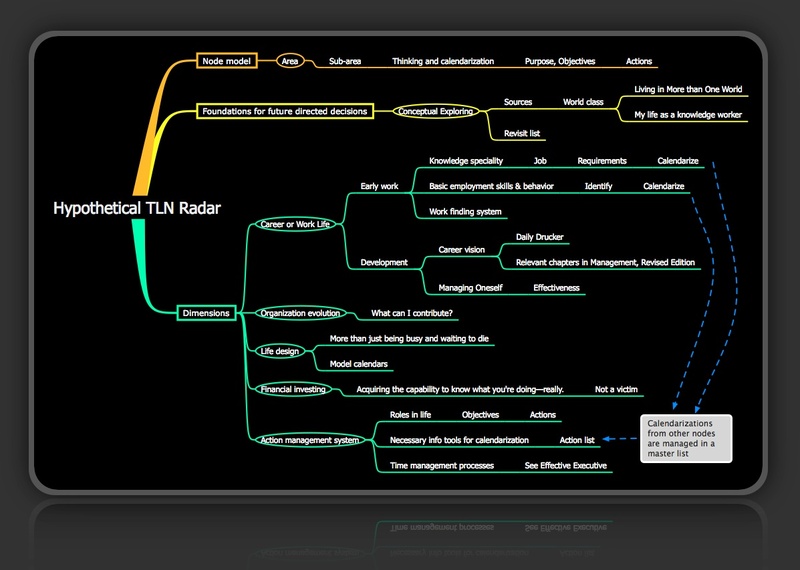 See TLN text site map for a view of the resources available here. For the vast majority of the adult population "Managing Oneself" will be the best action oriented starting point. For young people "Early Career Work" is more appropriate. The work approach includes a: "brainscape" and "brainroad;" foundation for future directed decisions; blueprint; conceptual "erector set;" and several conceptual tools. These are explored further down the page. Their meanings should be evident very soon. If you're a slacker, this site is not for you. If you believe that things take care of themselves, this site is not for you. If you think you can trust somebody else to look after your life, you haven't been paying attention the last thirty to forty years—those days are gone. So what's in it for you? You'll have to answer that yourself because it depends on your motivation. One thing is for sure. You can't work on things that aren't on your radar. What's the benefit of not becoming a prisoner of the past or your past? As you read further it should become much clearer. What's Time-Life Navigation ℠ © ? Time as a social resource: Effective executives know that time is the limiting factor. The output limits of any process are set by the scarcest resource. In the process we call "accomplishment," this is time. Time is also a unique resource. Of the other major resources, money is actually quite plentiful. We long ago should have learned that it is the demand for capital, rather than the supply thereof, which sets the limit to economic growth and activity. People—the third limiting resource—one can hire, though one can rarely hire enough good people. But one cannot rent, hire, buy, or otherwise obtain more time. The supply of time is totally inelastic. No matter how high the demand, the supply will not go up. There is no price for it and no marginal utility curve for it. Moreover, time is totally perishable and cannot be stored. Yesterday's time is gone forever and will never come back. Time is, therefore, always in exceedingly short supply. Time is totally irreplaceable. Within limits we can substitute one resource for another, copper for aluminum, for instance. We can substitute capital for human labor. We can use more knowledge or more brawn. But there is no substitute for time. Everything requires time. It is the one truly universal condition. All work takes place in time and uses up time. Yet most people take for granted this unique, irreplaceable, and necessary resource. Nothing else, perhaps, distinguishes effective executives as much as their tender loving care of time. 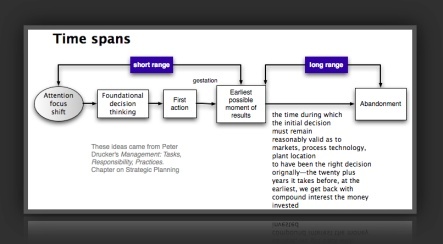 — From The Effective Executive by Peter Drucker. These ideas about time have major strategic implications! Unimagined Futures: "EVERY FEW HUNDRED YEARS in Western history there occurs a sharp transformation. We cross what in an earlier book, I called a "divide." See The New Realities—1989. Within a few short decades, society rearranges itself—its worldview; its basic values; its social and political structure; its arts; its key institutions. Fifty years later, there is a new world. And the people born then cannot even imagine the world in which their grandparents lived and into which their own parents were born. We are currently living through just such a transformation. It is creating the post-capitalist society, which is the subject of this book (Post-Capitalist Society by Peter Drucker). The time-resource quote above (time is the limiting factor) applies equally to personal time. As we get older we acquire roles and the expectations that come with those roles. This requires the right preparation!!! … A knowledge worker becomes obsolescent if he or she does not go back to school every three or four years. This not only means that the equipment of learning, of knowledge, of skill, of experience that one acquires early is not sufficient for our present life time and working time. … People change over such a long time span. They become different persons with different needs, different abilities, different perspectives, and, therefore, with a need to "reinvent themselves." You can't navigate to conceptual places you don't know about. The ones you know about are probably obsolete because you know about them—that's just the nature of life in a changing competitive system. The education system is of little help—other than providing a "passport" to knowledge careers and work. You are going to have to do it on your own. You are going to have to make your own attention switching and time investment decisions through out your life. Nobody else is going to do it for you. It is a gigantic mistake to base your decisions on what you see other people doing—they are not in your "shoes." The fact that you may have a fantastic job or whatever today means nothing (zero) to the future of society—your job and organization won't stop the non-linear future from unfolding. Remember corporate downsizing etc. ? See the wisdom of Peter Drucker, Ten Principles for Life II and Living in More Than One World: How Peter Drucker's Wisdom Can Inspire Your Life by Bruce Rosenstein for some navigation suggestions. To … somebody has to do something beyond routine, comfortable work—something to avoid becoming a prisoner of the past. Try filling in the blank in the previous sentence. Resources for working on this are introduced further down the page. If you examine the life stories of any prominent and successful organization you will detect "stages" in their life stories. Moving through these stages is a part of organization evolution. Motorola spinning off semiconductor business — Baffling. Does anyone but me find Motorola's announcement that it will spin off its semiconductor business a bit peculiar? How does a company manage to create and pioneer early markets, dominate, and then give up on the market? I'm talking about radios, TVs, and microprocessors, including RISC chips. When will the company bail on the cell-phone market it largely created? This is a weird business model. My advice to Motorola is to change the name to Motorola Market Development Company. It would make more sense. Motorola's behavior is far more appropriate than trying to ride out eventually dying products. In a fast-changing world, what worked yesterday probably doesn't work today. One of the fathers of modern management theory herein (Management's New Paradigm) argues that much of what is now taught and believed about the practice of management is either wrong or seriously out of date. If you don't explore this reality you will probably misdirect your efforts in the other four areas. In the years ahead (2020, 2030 …), what will people want in their lives and how will they act on their wants? What kind of system is needed to make sure we mature and not become prisoners of the past and mis-allocate our life and time? How should this system evolve as we mature? All five of these components interact and move in time. The preceding is a "brainroad" to explore. This is not a marginal detail or refinement. It addresses the real world in which we are all embedded. It is non-linear—tomorrowS aren't extrapolations of yesterdayS—although they grow out of it. Desired end result: A work approach that is adequate to the challenges ahead in a world moving (repeatedly) toward unimagined futures. This notion of unimagined futures can be easily tested. Pretend you were having a conversation with a highly intelligent, well informed person in 1920, 1940, 1960 etc. How far do you think they could see down the road? What do you think they imagined the future would be like? Would they have foreseen the Internet, Computers, global warming, the rise and fall of the Soviet Union etc.? Would they have foreseen The Age of Discontinuity? How would their views be shaped by their mental patterns or the future that had already happened? The buzz words that are so prevalent in many people's "communication" won't stop different tomorrowS. What makes the future the future? It it just the ticks of the clock? To work on something or to invest time on something it has to be on your radar. 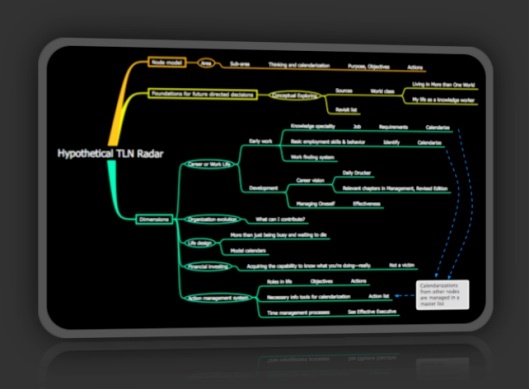 The image below is an example of a work map or work radar. It is an action blueprint and a conceptual "erector set." It is the result of a work approach: looking for relevant areas for future time investment; distilling promising ideas and converting them into further action. The process of creating, reviewing and revising one's map needs to be calendarized. Also every terminal node should end with calendarization. All of this is an application of thinking broad and thinking detailed. When you have your map you can test it to see if it is adequate to the (your) challenges ahead. Without doing this work you will surely become a prisoner of the past. Above I've mentioned "erector set" several times and provided a link to my text site map. On the site map there are links to the contents of quite a few books and articles. The elements of each could be viewed as a building block of an action design—a conceptual erector set. Also these resources can be used for creating Internet searches—Google or Amazon.com. If you've been seriously reading this page then you've been down a "brainroad" while creating a foundation for future directed decisions. All of the above are conceptual tools. Below are some links to other valuable conceptual resources. Never give up: I resolved that if I ever reached an advanced age, I would not give up, but would keep on. Strive for perfection: I have always known that one has to strive for perfection even if only "the gods" notice. Continuous learning: So, for more than sixty years, I have kept on studying, one subject at a time. This has not only given me a substantial fund of knowledge. It has also forced me to be open to new disciplines and new approaches and new methods—for every one of the subjects I have studied makes different assumptions and employs a different methodology. Annual review: I have set aside two weeks every summer in which to review my work during the preceding year, beginning with the things I did well, but could or should have done better, down to the things I did poorly and the things I should have done but did not do. I decide what my priorities should be in my consulting work, in my writing, in my teaching. I have never once truly lived up to the plan I make each August, but it has forced me to live up to Verdi's injunction "to strive for perfection" even though "it has always eluded me" and still does. New assignments: When I have a new assignment, I ask myself the question, "What do I need to do now that I have a new assignment, to be effective?" Every time it is something different. Learning from feedback: Whenever a Jesuit priest or a Calvinist pastor does anything of significance, for instance, making a key decision, he is expected to write down what results he anticipates. Nine months later, he then feeds back from the actual results to these anticipations. This very soon shows him what he did well and what his strengths are. It also shows him what he has to learn and what habits he has to change. Finally, it shows him what he is not gifted for and cannot do well. I have followed this method for myself—now for fifty years. It brings out what one's strengths are—and this is the most important thing an individual can know about himself or herself. It brings out where improvement is needed and what kind of improvement is needed. Finally, it brings out what an individual cannot do and therefore should not even try to do. To know one's strengths, to know how to improve them, and to know what one cannot do—they are the keys to continuous learning. Management's New Paradigm by Peter Drucker. Different content from the similarly named chapters in Management, Revised Edition and Management Challenges for the 21st Century. Consider adding these to your resume planning. … Those who do work on these challenges today, and thus prepare themselves and their institutions for the new challenges, will be the leaders and dominate tomorrow. Where's your next focal point and what foundation is needed for that decision? An alternative way of helping with future site enhancement: Click an Amazon ad below and buy something—no obligation. I get a very small commission from your purchase (within a limited time window of a few hours). You and your friends can repeatedly use this mechanism to assist. Just bookmark one of my pages with this ad and return. Thanks for your help. Related search words: financial investing life navigation system Wealth creation general management plan change social executive thinking. Change management evolution work wealth preservation worker thinking outside the box leadership world class management. Marketing Innovation Economic Development strategic management career economic planning. Vision knowledge management learning developed world business transformation creation.